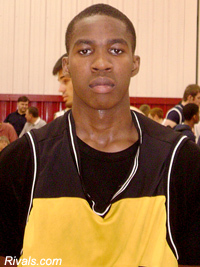 Rob Brandenberg was the first commitment in the Class of 2010 for Shaka Smart and the VCU Rams. He committed after exploding over the summer after being relatively unknown as a junior playing in the shadow of Rivals150 recruit Stevie Taylor at Gahanna Lincoln in Ohio. His play over the summer garnered him recognition from Rivals.com as the #11 overall prospect in the talent-rich state of Ohio. Several Division 1 offers followed including Butler and John Groce's Ohio Bobcats who recently knocked off Georgetown in the first round of the NCAA tournament as a 14-seed. Brandenberg is a long and athletic 2-guard with a relatively large wingspan (6'7) to his height (6'2). He is one of the biggest risers on the Ohio hoops scene, coming from virtually nowhere as a JV player who burst onto the Varsity his junior year. He stars along with 2 other Division I prospects in Stevie Taylor and Anthony Jackson. I will be the first to admit, I didn’t see the flash at first either, but my mind changed on Wednesday, July 8th at 2pm when he caught flame like a Columbus Wild Fire against Ricardo Johnson in the Silver Championship game. For 10 minutes I saw something that very few and far between witness and that was something we like to call in the business as “The Zone”. He was slicing, dicing, cutting the opposition apart like a Billy Mays infomercial! He is blessed with the ability to blow by guys with a quick first step, he can create his own shot off the bounce and plays with a sudden burst and gear that most are not given at birth. He can keep you honest from 19 feet, but then hurt you if close out hard and gets to the rack and finishes above the rim in a half court set or transition. His High School team runs the Princeton style offense so you don’t get to see much off the bounce, but you see the fluidity in the break when he runs the lanes like a thoroughbred. His name you ask? Rob, Rob Brandenberg.From where you wonder? Gahanna Lincoln High School.What year? He’s a 2010. What position? Scoring Guard. How tall? 6-foot-2. 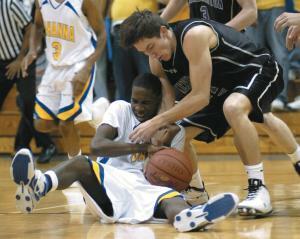 May, 2009: This long and athletic guard plays with great energy. He sprints the lane in transition and can get to the rim and finish before the defense can set. Brandenberg does a good job of making scoring plays of the dribble in the half court and can finish with good touch and body control. He is also athletic enough to get the ball in the hole with some impressive athletic finishes. He is streaky but respectable from behind the arc and can finish above the rim off the vertical with a clear path. Brandenberg also puts forth excellent effort on the offensive glass. Brandenberg needs to add strength but has great upside and could be a player on the rise in the state of Ohio. Rob Brandenberg led all Gahanna scorers with 19 points as the Lions shocked the high school basketball world and thrashed the #1 team in the country by 26 points by a score of 71-45. Taylor, Brandenberg, and Jackson led Gahanna to a hot shooting night and ended the Vikings' season. Subsequently Brandenberg's team was named the #9 team in the nation by ESPN RISE. Brandenberg has had a stellar season and is a recruit that Shaka could just not pass on. His combination of speed, athleticism, and shooting touch make him a very intriguing prospect.